1 of 1 In a medium bowl, whisk buttermilk, sour cream, mayonnaise, chives, lemon juice, salt and pepper. Stir in cucumber. Refrigerate. 1 of 3 Heat 2 tbsp of the oil in a large nonstick skillet over medium-high heat. Coat scallops in flour and add half to skillet; cook 2 minutes per side. Season with 1/8 tsp each of the salt and pepper. Remove to a plate. Add remaining 1 tbsp oil to skillet and cook remaining scallops. Season with remaining 1/8 tsp each salt and pepper. Remove to plate. 2 of 3 In the same skillet, add corn and cook until charred, about 3 minutes. Stir occasionally. 3 of 3 In a large bowl, toss greens, frisee and fennel with half the dressing. 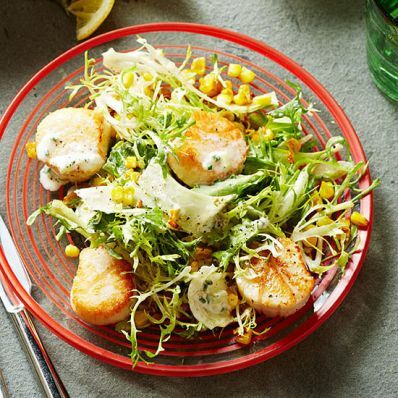 Add scallops and corn. Serve with remaining dressing. Per Serving: 3 g sat. fat, 103 mg chol., 22 g Fat, total, 496 kcal cal., 4 g fiber, 36 g carb., 800 mg sodium, 44 g pro.